This waterfront property features granite steps and paths down to a two-slip boathouse and another to a separate dock, both with spectacular sweeping views down the lake. With 200 feet of lakefront and a southern exposure, enjoy sun all day! There is a shallow beach area by the shore for the little kids, and great deep water swimming off the end of the dock. 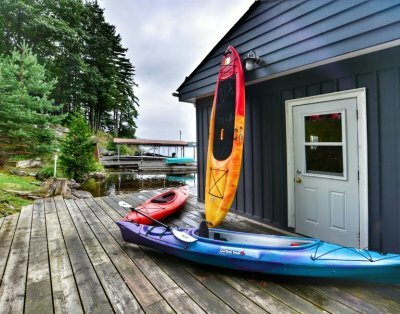 Enjoy the water with two kayaks and two canoes provided. 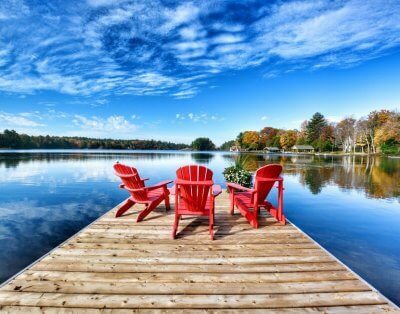 Inviting Muskoka Chairs entice you to kick back and relax – cup of coffee for the sunrise and glass of wine for sunset! The property is wooded and features a fun trampoline for the kids, and of course a fire pit for a lovely campfire under the stars. French doors off the dining area open to a massive sun-drenched 30×30 foot lakeside deck where you will find the propane grill, outdoor dining and lounging and a fantastic hot tub. Stupendous views of sunsets over Lake Muskoka from up here! Three bedrooms are found on the main level, all with wonderful wood beds. The first bedroom features a luxurious King size bed, while the second one has a lovely Queen. The third bedroom – perfect for the kids – boasts not one but two single/double bunks and sleeps 6! The 5pc bathroom has been newly renovated and features double sinks. The laundry room is equipped with a washer/dryer and an extra fridge, plus a side exterior door. A hidden jewel – the loft offers up an intimate master bedroom with loads of natural light. Delightfully furnished with an irresistible King bed and complete with a 4pc bath with shower and tub.